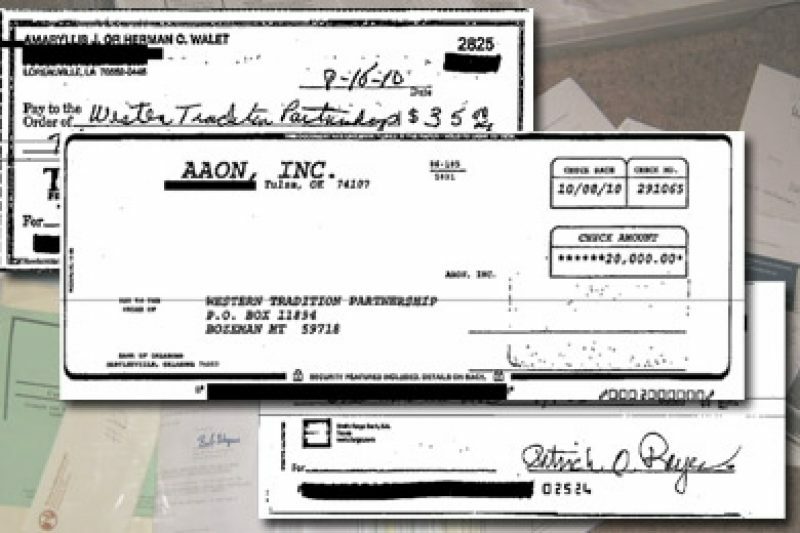 ProPublica and Frontline are putting checks written to Western Tradition Partnership online. Released under a court order last week, the records give a rare look inside the controversial dark money group. Dec. 21: This post has been updated. Last week, when a Montana district judge ordered the release of its bank records, Western Tradition Partnership became the first modern dark money group to have all of its donors made public. The records showed that the contributors to the controversial group — which has resisted attempts by Montana regulators to get it to register as a political committee and report its donors — included wealthy individuals, corporations and other nonprofits. All told, the documents reflected that WTP collected almost $1.1 million between March 2008 and December 2010, some of which was used to try to sway state and local elections in Montana and Colorado. Today, after redacting addresses, phone numbers and account numbers, ProPublica and Frontline are putting all six batches of checks to the group online. Based on other documents, some of which were found in a Colorado meth house in late 2010, WTP has faced allegations that it illegally "coordinated" with political candidates, helping to shape their campaigns. It's unclear what, if anything, WTP's donors knew of its operations — or if the candidates themselves knew what the group was doing behind the scenes. The bank records show the biggest individual donor to WTP was Norman Asbjornson, a Montana native who gave $50,000 to WTP in August 2008 and whose heating and cooling company in Tulsa, Okla., gave $20,000 in October 2010. In an interview Monday, Asbjornson said he gave money to WTP in part because the group was working to elect state representatives who embodied Montanan values. "They gave me a list of representatives that reflected their views," he said. "They didn't say how they were supporting (them)." 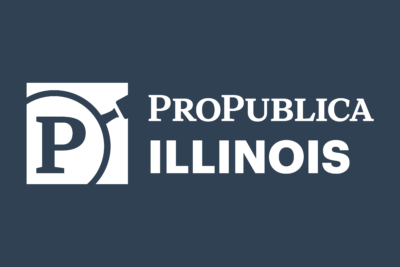 ProPublica has reported on how some social welfare nonprofits, or dark money groups, have exploited gaps in regulation between election authorities and the Internal Revenue Service to pour tens of millions of dollars from secret donors into political campaigns. Although small compared to some dark-money organizations, WTP has won national attention for filing a lawsuit that led the U.S. Supreme Court to apply its Citizens United ruling to states. 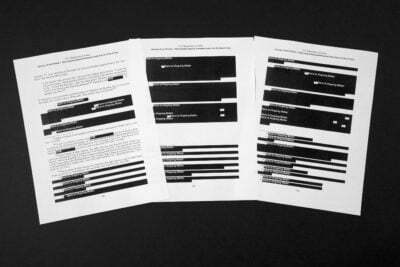 The unusually abundant cache of documents available on the group shows it used its veil of secrecy to recruit donors: A PowerPoint script for potential donors provided to Montana regulators by one of the group's former contractors said people and corporations could donate as much as they wanted anonymously and then "sit back on election night" and see what a difference they made. Under the tax code, social welfare nonprofits are allowed to engage in politics but cannot have this as their primary purpose. When WTP asked the IRS to recognize its tax-exempt status, it said, under penalty of perjury, that it wouldn't spend money on politics, yet it was already doing so. 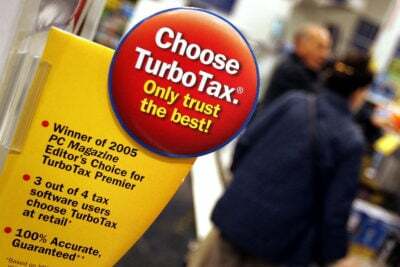 As ProPublica has documented, dozens of other social welfare groups have used similar tactics in gaining IRS approval. 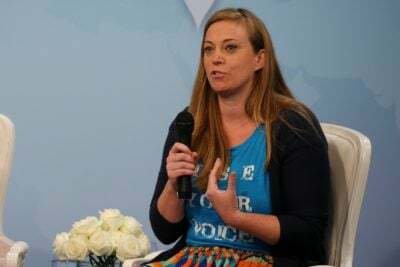 Christian LeFer, a strategist for the group in the 2008 and 2010 Montana elections, has denied that the group broke campaign-finance rules, saying he worked "scrupulously" to avoid the possibility of coordination. WTP officials also have said the group does not campaign for particular candidates; instead, they say it educates voters on where candidates stand on certain issues. WTP, now known as American Tradition Partnership and based out of a post-office box in Washington, D.C., remains locked in an ongoing dispute with Montana campaign-finance regulators, who in October 2010 said the group should disclose its donors. WTP's lawsuit in that case is scheduled to be heard in March. In an interview Tuesday, the state's outgoing governor, Democrat Brian Schweitzer, opined that WTP was a "criminal enterprise." "Think about this—you've got folks who won't say who they are, won't say where they live, run out of a post office box," Schweitzer said. "Who are these people? They're clearly violating Montana laws." In the 2012 election, much of American Tradition Partnership's focus in Montana was on the race to replace Schweitzer, who couldn't run again because of term limits. It funded attacks on Democrat Steve Bullock, the state's attorney general, sending out two fake newspapers to Montana residents in the final weeks of the race portraying him as soft on child predators. The Associated Press declared Bullock the winner Wednesday, saying he had eked out a narrow victory over Republican Rich Hill. As the election unfolded, LeFer and Donny Ferguson, who now runs American Tradition Partnership, posted on Facebook, taking aim at recent coverage of the group. LeFer posted a message to Ferguson on Facebook on Tuesday night. "‘Sitting back on Election NIght (sic) watching what a difference I've made' – Just paraphrasing from a stolen PowerPoint presentation I'm reading," LeFer wrote about 8 p.m. Montana time. Ferguson, whose Facebook page is public, then clicked that he "liked" LeFer's comment. Although Ferguson did not reply to requests for comment, his Facebook page showed that on election night he was in Texas celebrating the return of conservative Steve Stockman to Congress, after 16 years out of office. Ferguson, Stockman's campaign manager, proclaimed, "We're baaaaaaaaaaack" on his Facebook page and said he autographed a campaign bag next to the signature of Gov. Rick Perry. Ferguson didn't mention Bullock, but an earlier post made it clear how Ferguson felt about Frontline's documentary on WTP, which aired Oct. 30 on PBS. "I don't think PBS understands who just just (sic) committed a felony against," Ferguson wrote on Facebook the day after the broadcast. "I'm not one of these pearl-clutching marshmallow Republican squishes who doesn't like blood. I go Scottish Texan on people. Calm, cool, collected headhunting. I collect ears and skulls. And most importantly I follow the law and rain helllfire (sic) on those who don't. 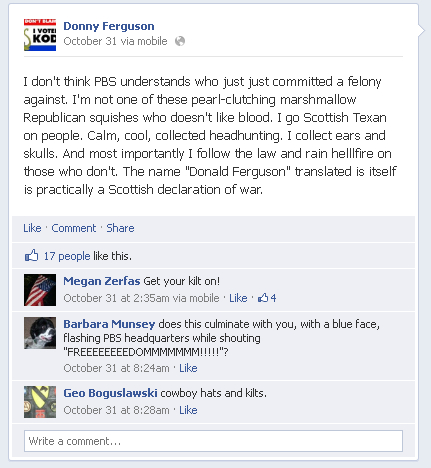 The name ‘Donald Ferguson' translated is (sic) itself is practically a Scottish declaration of war." Update (12/21): A federal grand jury in Montana has subpoenaed documents from Western Tradition Partnership, a dark money group that has been active in state and local elections in the West. The Associated Press reported that the head of the state’s Commissioner of Political Practices testified in a court hearing on Thursday that his office had turned over documents related to the group to federal authorities the day before. The testimony came as part of a court case in which Western Tradition Partnership had sought the return of documents it says were stolen in 2010. The records later turned up in a Colorado meth house and were turned over to Montana authorities. The subpoena request covered the meth house documents, Montana authorities said. It’s not clear what the grand jury is investigating, as testimony is confidential.